A steamy, yet clean Romance Novel. If only one word could be used to describe Evie's Knight the one that instantly comes to mind is beautiful. Kimberly Krey has a natural gift for writing, and has created a story that not only entertains but touches the heart. Evie's Knight was a work of art in itself being equal parts romantic, suspenseful, artistic, and unique. The story was very original and strayed from the sometimes over-used cliches of other books in the genre of paranormal romance. I really enjoyed the reoccurring themes of art, desire, food, and darkness that helped shape the overall vibe of the book. The characters were terrific, diverse, and lovable, and far from any plain Jane or Susie Q. Each character Kimberly had created were so real, relate-able, and filled with their own flaws and quirks that made them unique and believable. Evie was a strong voiced leading lady that had me rooting for her the entire time. Calvin was irresistibly delicious like the food Evie cooked throughout the story. Parker, Calvin's older brother, was a funny smart mouth with a cocky side but a great character nonetheless that you could never bring yourself to hate. You know that an author has created a great male character when the readers are wishing they had their very own Calvin Knight for themselves. The action scenes were wonderfully executed and I found myself cringing and grimacing at times while reading them. It's also admirable how Krey was able to keep the romance clean but still make your blood heat up. Beautiful, well described imagery created an experience for the senses as well as the imagination. My freshman year of college was similar to that of Evie Wylder minus hunky Calvin Knight and an evil witch trying to kill me, which helped me relate to the main character. Having a friend much like Kelly, Evie's best friend, get engrossed in a world of constant partying, drinking, and going wild I felt the loss all over again while reading this book. I wasn't even a quarter way through the book when a classic love song began playing in my head that seemed to appropriately capture the passion between Evie and Calvin, and that song would be Enrique Iglesias's Hero. After you read the book, listen to that song, you'll understand what I'm saying. The emotion in this book is raw and was so greatly written my emotions were all over the place while reading Evie's Knight. Whether you thirst for romance, the supernatural and paranormal, adventure, suspense, action, or just a downright good book Evie's Knight is a novel that can reach out to a diverse group of readers. In my opinion, Evie's Knight deserves way more reads, and not just because it made it to my favorite books' shelf, but also because it's just awesome. 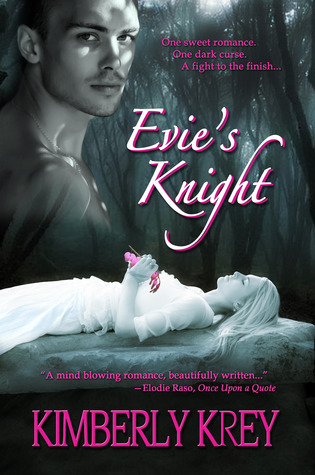 The new cover of Evie's Knight is absolutely stunning, wouldn't you agree? Being able to read the epilogue was really heart warming and it felt like being reunited with old friends. Not to mention the huge surprise mentioned at the back of the book Fiona's Fight! The second book of the series will be coming out! :D I'm beyond stoked for its release and will definitely be reading it as soon as it comes out. Lucky for you guys you'll be able to read an excerpt from Evie's Knight so that you can understand why I love this book so much. Check out the excerpt blog post here. Don't forget to check out the Evie's Knight Giveaway post here.